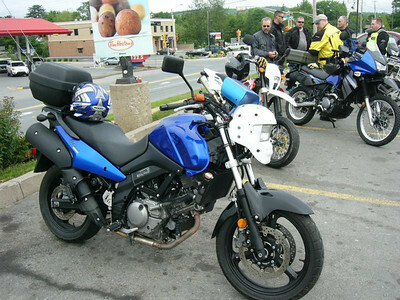 0930, as agreed, found the majority of riders happily talking bikes and swilling coffee at Tim's in Fall River. 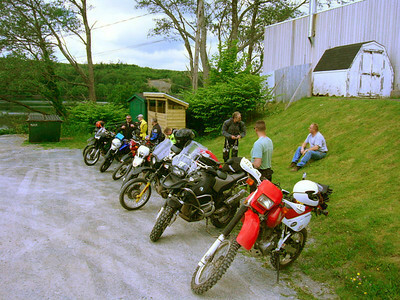 We were a mixed fleet with KLRs an XR, Husky, VStrom and BMW. We were to pick up a second BMW by the airport to round out our numbers to eight. 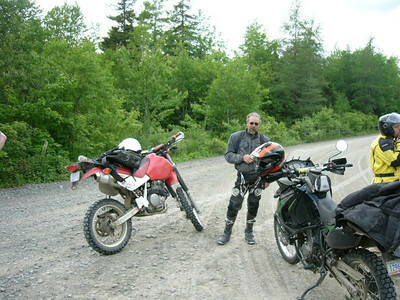 The Plan: A leisurely ride out the Old Guysborough Rd (OGR) through middle and upper Musquodoboit and eventually into Sheet Harbour for lunch then returning along Hwy 7. 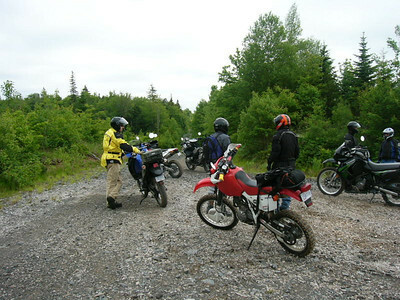 We did discuss the possibility of exploring some dirt roads. Leaving Tim's we elected to skip the hwy slab and take a secondary road that google maps indicated linked up with OGR. Google maps being a accurate source of topographical information we felt confident even as we passed the sign on Perrin Rd indicating NO EXIT. 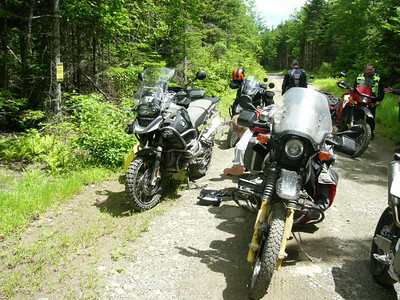 The road did turn into a trail following the pipeline and with the exception one ditch that surprised two of us it was a a good start to the ride and did take us back to the OGR where we picked up the second BMW being ridden by the proverbial swiss army knife of riders. 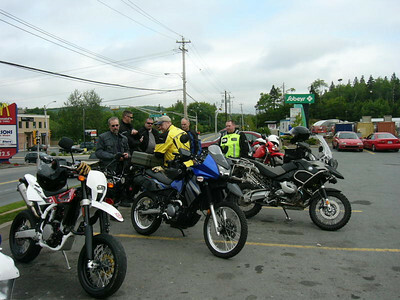 The ride into Sheet Harbour was scenic and a nice way to spend 1.5 hrs. 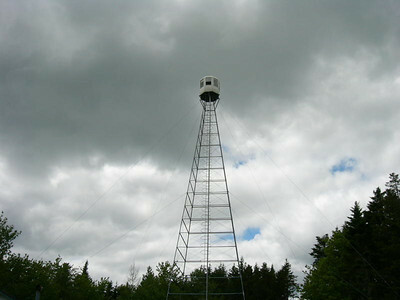 Once there we grabbed lunch at Fairwind Hotel/Restaurant to refuel. After lunch we agreed some exploring was in order and headed up the 374 until we crossed into Liscombe Game Sanctuary (LGS) and took the first right to get our first taste of dirt. It as on this track we had our first casualty of the day. Somewhere along the trail I had snagged a rock that took out my kick stand sensor and the bike shut downShocked. A proud moment as we relived the Long Way scene where one of their bikes is similarly disabled. No problem though, plenty of know how from our on site Mr. Fix All (MFA - Star) and we were back up and running. 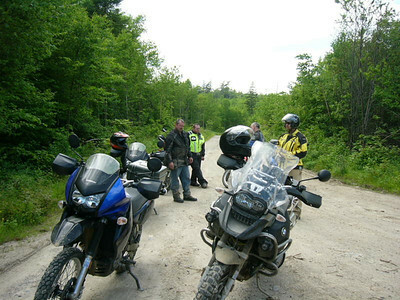 This road/trial petered out but made the group keen for more so we moved further into the park looking for Governors Lake Rd. From GLR we took a route...not sure what route but a route that was made up of fun fast fire roads and in one area a nice vantage point that was high enough to see a fair piece. It was here that we began to really explore and explore for about 2.5hrs - WE WERE NOT LOST.... we were finding out bearings. Turns out many of the secondary logging roads are not on the GPS, who would have guessed? Once fully committed to getting back to the 374 we figured out the return route, thanks mostly to those who were truly paying attention on the way in, and we made it back to the hardball of 374 and made the turn to head back to Sheet Harbour. At this point a few are low on fuel and we all look like we've reversed the shop vac on ourselves. 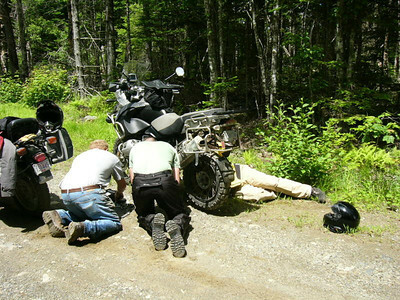 On route back to Sheet Harbour two bike ran out of fuel...MFA, nuff said. We made Sheet Harbour, fueled up and agreed that although it was now closing in on 7pm it had been a great day. Time to get on hwy 7 and head for home and that's just what we did, with one minor pit stop to chat with the local constabulary about my interpretation of speed limits, he was kind enough to warn me that I needed to adjust my views to the left to avoid further meetings. 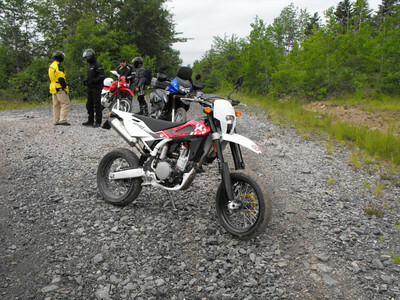 I think the consensus was that it was a good trip with scenic road ways and unspoiled (by atv) trails. 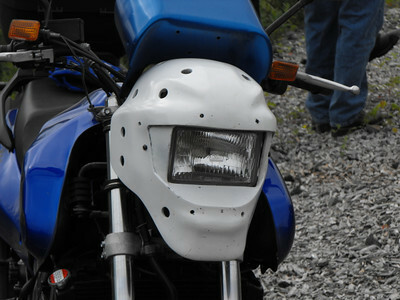 Amazingly two bike rolled through the day on street tires, honorable mentions to the VStrom for an amazing showing at getting it done and accolades to MFA for the know how, tools and ingenuity to fix the problems of the day Clap. The day did get a little long and I imagine all slept well after a 580km.